From fashionable trinkets to borders of all kinds, a tiny, nameless store on Ebrahim Sahib Street will ensure that your next blouse for shaadi or sangeet scenes is the talk of the party. Prices begin at a mere 20 bucks! 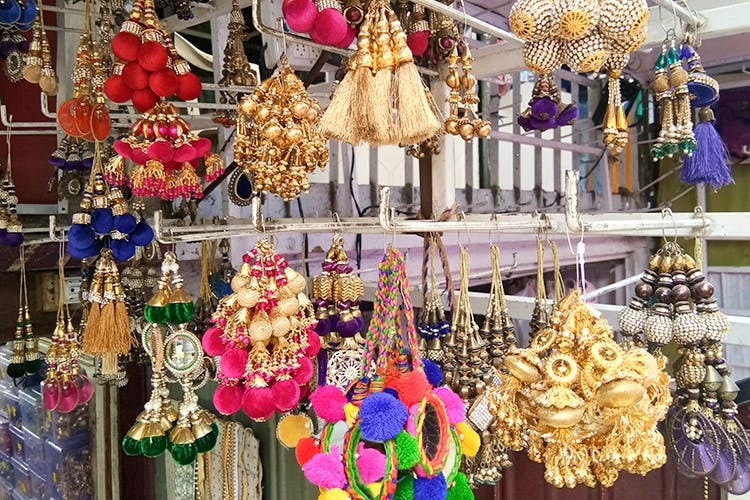 Narayan Pillai street is dotted with stores that specialise in borders, laces, and blouse embellishments. But they tend to be a tad heavy on the pocket. If you are looking for a wallet-friendly option, then, we recommend you follow our lead. Right below the Duppata Centre that’s at the corner of Narayan Pillai and Ebrahim Sahib street, there’s a store (it’s the one in the centre) that’s stocked up with everything you need to pretty up a blouse. You can opt for the blouse hangings that adorn the front of the shop. There are simple tassels made with thread or geometric patterns crafted from metal. You can also pick up ones that feature mirrors and baubles. These come in classic colours like gold and silver but you can find them in a range of other colours too. Prices begin at INR 40 and go up to INR 200. The other offering of the store is borders. Here too you have a variety. At the lower end (starting at INR 20 per metre), you can get no-frill, thin laces in golds or silvers. Up your budget and you can take home thick borders (great for blouses or even lehengas) with mirror work, beads, and whatnot. This is a tiny, hole-in-the-wall store so their collection while vibrant is not endless. If you are looking mind-boggling variety, you might want to look elsewhere.